Nokia’s all-you-can-eat music subscription service, will launch first in the UK next month, but the real news is the lack of carrier support. Instead, Comes With Music will be offered on a pre-pay handset only, the slightly dated Nokia 5310 XpressMusic, sold exclusively through Carphone Warehouse, the same retail chain who in conjunction with 02 have partnered with Apple to sell the iPhone. 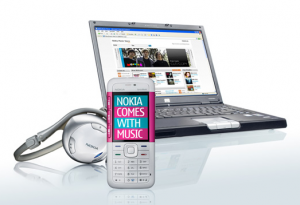 Described by Nokia as “a revolutionary way for people to discover and enjoy music”. Comes With Music gives those who purchase a supported handset “unlimited access to the entire Nokia Music Store catalog with the ability to keep all downloaded tracks even after the year is over.” It’s seen as a direct attempt by the world’s number one handset maker to take on Apple’s iPhone/iTunes music service – ironic considering that both offerings will now compete for shelf space at the Carphone Warehouse during the busy Christmas period. As we’ve noted before, Nokia’s aggressive moves into the ‘services’ space was bound to hit a nerve with carriers who offer their own competing products. According to The Guardian newspaper (via mocoNews), Nokia has touted Comes With Music to all five UK networks, none of whom have found it attractive enough to bite. So far at least. The major labels on the other hand seem more than willing to play ball. To date, Universal Music, Sony BMG and Warner Music have already signed on, and Nokia is hopeful that EMI will also soon join.